Are you having fun with the challenges yet? I hope so! 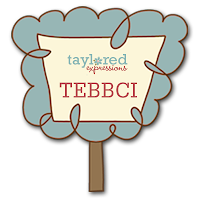 I'm bringing you challenge #4 in the Taylored Expressions Birthday Bash (TEBB). . .a color challenge! It's no surprise that I LOVE bright, happy, fun colors that make me smile! The colors for my color challenge are (in Prism colors) Intense Kiwi, Nautical Blue Light, Sunflowers Medium. You can find this color pick HERE in the store! Of course, if you don't have Prism papers, use like colors in the brand that you do have! CHALLENGE: Use Intense Kiwi, Nautical Blue Light and Sunflowers Medium (or like colors) on your creation. You can find the Prism Color Pick HERE. KEYWORD: Upload your creation to your blog or online gallery (or both). If you’re uploading to online galleries, use the keyword TEBBCI. Come back to this challenge and leave a comment with a direct link to your creation! In order to be eligible for the prizes, you must leave a comment with a link to your card by midnight PST Wednesday, September 9th. I can't wait to see what you create! 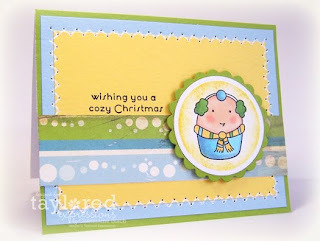 For my card, I used the Season's Sweetings and Home Sweet Home sets from Taylored Expressions. I'm not a big fan of winter and the cold weather that comes along with it, but I just LOVE sunny days in the winter and how the sun sparkles off of the snow! These colors remind me of that and would bring warmth and cheer to anyone during those cold months, or it would just be a perfect Christmas card for someone on your list who lives in a warm, sunny place! Enjoy the Birthday Bash and I look forward to seeing your creations! I really love this color combo - so bright and cheerful! Great colors and SWEET SWEET card! Here is my card for the tri-color challenge. Enjoy! Great colors Charmaine! I played along just for fun! Great colors -- bright and fresh! Here is my card for the challenge. Thanks! What a great color combination! I had a lot of fun with this one, thank you so much for hosting! LOVED these fun happy colors together! These colors worked great for a birthday card! Thanks =) Yours is adorable. Great challenge. I love these colors together. Here is my card. FUN Colors!!! Here is my card for the challenge...thanks so much!! What fun colors and a cute card. Here's MY CARD. Loved the colours, although I did use a different green to work with my patterned paper - thanks for the inspiration! I hope this card fits your color challenge. I had to use what I had in my studio. I still had a lot of fun doing this challenge. Thanks!! !